Saarbrücken, March 08, 2017: AbsInt, the specialist for program analysis tools for safety-critical software, has launched a new product line. RuleChecker is a fast and easy-to-use static analyzer for checking coding guidelines and computing code metrics for C programs. Supported standards include MISRA C:2004, MISRA C:2012, MISRA C:2012 Amendment 1, ISO/IEC TS 17961:2013, SEI CERT Secure C, and MITRE Common Weakness Enumeration (CWE). Customer-specific rule sets can be added on request. Additionally, RuleChecker can check for various code metrics such as com­ment den­sity, cyclomatic complexity, or number of instructions per function. Interactive graphs, charts, and tables enable efficient exploration of the analysis results. RuleChecker also offers a batch mode for use in continuous integration frameworks. The analysis results are accessible in open formats and can be automatically processed. A flexible client/server architecture supports a wide range of rollout scenarios. Seamless integration with TargetLink, Jenkins, and Eclipse is actively supported. RuleChecker is available both as a standalone tool and as an integral part of the runtime error analyzer Astrée. Astrée is a sound static analyzer of C source code. Its primary purpose is proving the absence of runtime errors, including divisions by zero, buffer overflows, data races, and deadlocks. Coupling RuleChecker with Astrée enables zero false negatives and minimal false positives to be achieved for semantical rules. RuleChecker can be automatically qualified according to DO-178B/DO-178C, ISO 26262, IEC 61508, EN-50128, and other safety standards. 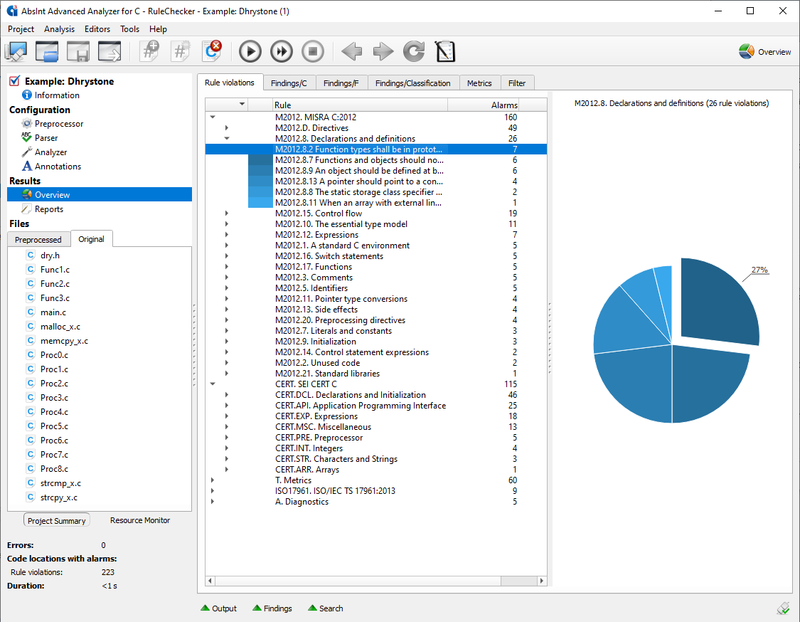 RuleChecker primarily targets safety-critical embedded applications, but can also be used to analyze any structured C programs, handwritten or generated, with complex memory usages, dynamic memory allocation, and recursion. For further information, visit absint.com/rulechecker. AbsInt provides advanced development tools for embedded sys­tems, and tools for validation, verification and certification of safety-critical software. Its flagship products are aiT for worst-case execution time analysis, StackAnalyzer for static stack-usage analysis, Astrée for proving the absence of runtime errors and invalid con­current behavior in safety-critical C programs, and CompCert, the only formally verified optimizing C compiler in the world. For further information, visit www.absint.com.